Just Jingle: A Tweet New Card and WOYWW! *Ugh! * That has seriously got to be one of the worst puns out there, but alas, I still used it. These things just happen. What do you want me to do about it? I was born this way. HA! Annnnyway..... I DO actually have a super fun card to show you. 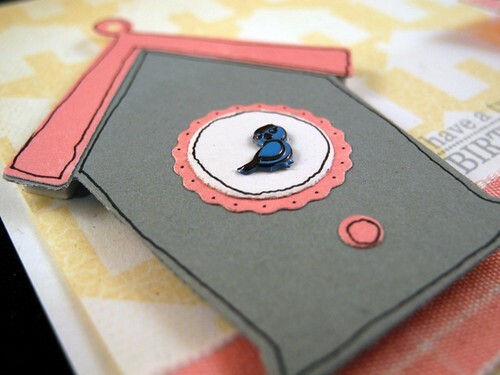 I got to play with the brand new SUPER CUTE Mini Bird Brads from the Eyelet Outlet, along with the new dies I recently bought for a GREAT deal AND some pretty ribbon from May Arts! ACK!!! I just love the tiny bird!!!! Seriously. You have no idea how big of a smile those little things can produce until you have held one in your hand. They are SOOO CUTE!!!!! MY DESK IS A MESS!!!!!! Last weekend was submission crunch time. Hmmm...can you tell? HA! I will have to clean it up before working this coming weekend, but in the meantime, I'll have to deal since my work time during the week is much more limited and I just get straight to it. I do have some shrink plastic circles there that have been stamped and are ready to be shrunk! I haven't made a final decision on what the end product will be quite yet, but it will be done tonight! Other than that, there is just a hubbub of insanity! Lots of paper, tools, lists, etc. I love this hobby. I really really really really really love it. I just do. K. So that's all for today, as I can already feel a horrible case of the rambles starting up. I am TELLING you...it's the jelly beans. I did do a new workout this morning and spent 10 minutes on abs...let's just say I am QUITE aware of each and every one of those ten minutes. That's a good thing, right? Right. K. Thanks. Bye now. OH! For more WOYWW posts check out Julia's blog! K. Now I'm really leaving. I'm totally out for the day. I promise. adorable card and love the stamps on your desk! ohoooo super cute birdhouse, I want to go and draw one right now! Thanks for my snoop! Have a great crafting week. Love the peek at the desk. And kudos on the ab work! LOVE LOVE the card. My desk is starting to look like yours - it's driving me insaneeeeeeeee LOL!! 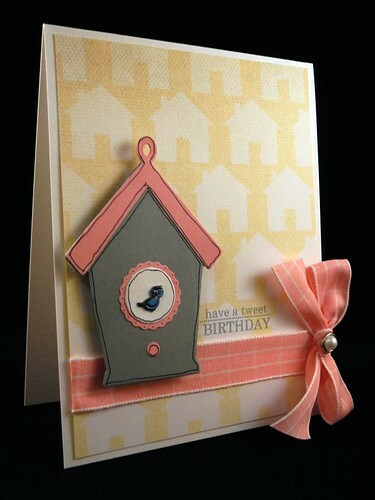 this card is so adorable...I love that paper you used for the background and that little bird house is so darn cute...and perfectly matched with that ribbon...love it..
Beautiful card...great colors. And that ribbon - oh my - so pretty! Beautiful card, love the cute little bird! Loving the post submission fall-out, shows a lot of creativity has gone on there! Adorable card! I love those colors together. Great creative desk shot-loved zooming in and getting a good peek. I am nosey like that. Love the messy desk lol. Love, love this card! I did visit the other blog and your other cards are sweet too:) So you buy gift bags and tissue to match your outfits...nothing strange there...hahaha. 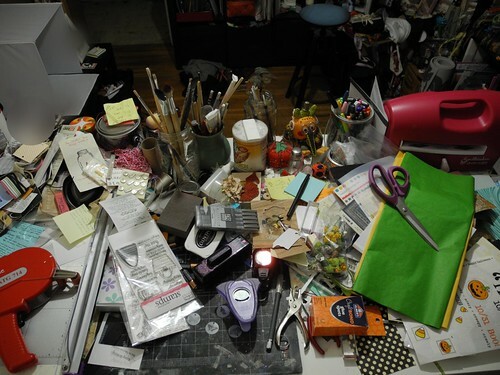 Love your messy desk-I create and clean up most of the time so I don't have a mess to show off! Hope you'll be showing us what you do with those Shrinky-Dink circles. FYI: "A messy desk is a sign of genius." Just sayin'. Very cute card, I really like the colors! Super cool messy mess, love it! At least it's produced a super cool cutey card too. the card is one of my favorites!!! Your card is gorgeous, Jennifer! I love that glossed up little bird. Fabulous colours, too! Adorable card, Jingle! LOVE the bird eyelet. I love birds, and right now in central FL we have an abundance of migrating songbirds, just waiting for the signal to move on north. They're filling the skies with beautiful music just around dawn -- so your card really made me smile today! I have a question, I've been out of touch with all things crafty for a while ... what's the red thingy on the back of your desk just beyond the tissue paper? That is an adorable card! I do love puns, and it really isn't all that bad.... hee hee The card is so very cute - love the background paper. Your desk - holy moly! I LOVE IT! Tweet indeed!! Love the card. It probably bears mentioning I love bad puns, birds, birdhouses and doodling round the edges of things lol. Your desk is just exploding with craftiness. Thanks for the tour :D. Happy WOYWW AND Pi Day! Wow, that is one crazy messy desk. I'm glad to see that I'm not the only person who can spawn one of those. Love the bird brads too! I visited eyelet outlet once after they started selling brads and quickly clicked away and vowed to never go there again. It would be bad for the budget. Well i fyou can't c-ordinate an outfit to what you're going to be carrying, why would you even step out!! OH you did make me smile and I bet you looked super cute! Abs. What are they then?! Such a sweet card:) And I like your crazy 'nest' (keeping with your tweet theme) ~ it's obvious a real artist is hard at work! I would just say that this post is for the birds! Well, looks like the desk is too for that matter. lol One can never be creative without a bit of mess. My blog is sort of Catty this week. lol Join in for my give away too if you wish. I'm having a terrible time getting Blogger to cooperate with me this week. I'm in LOVE with that bird house card. Not sure that's all that made the mess on your desk, but it was well worth it!